The route begins at Petit Roche Plaza in the River Market District of downtown Little Rock. “Petit Roche” was the name given to the first rock outcrop early explorers encountered on their way up the Arkansas River. It is near this outcrop that the eastern end of Arkansas State Highway 10 (AR-10) is now located. From here, you will tour the 139-mile length of AR-10 to its western terminus at the Oklahoma state line, just past Hackett. This route traverses a beautiful and geologically diverse cross section through the mountains of western Arkansas. 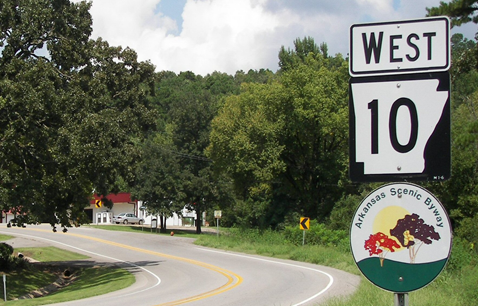 The stretch from Ola to Hackett is designated as an Arkansas Scenic Byway. An overview of the physiography of Arkansas, the concept of geologic time, and the rock formations and structural regions encountered along AR-10 introduce the reader to the detailed Road Guides that follow. The Road Guides describe the rock outcrops and geologic features along particular sections of the route. They contain many wonderful color photographs and color-coded geologic maps to help travelers understand the landscape passing outside their windows. Travelers are encouraged to get out of their vehicle at several places to have a look at the rocks, perhaps gaining a new appreciation of their significance. An illustrated glossary defines words and concepts that may be unfamiliar to those without an earth science background. 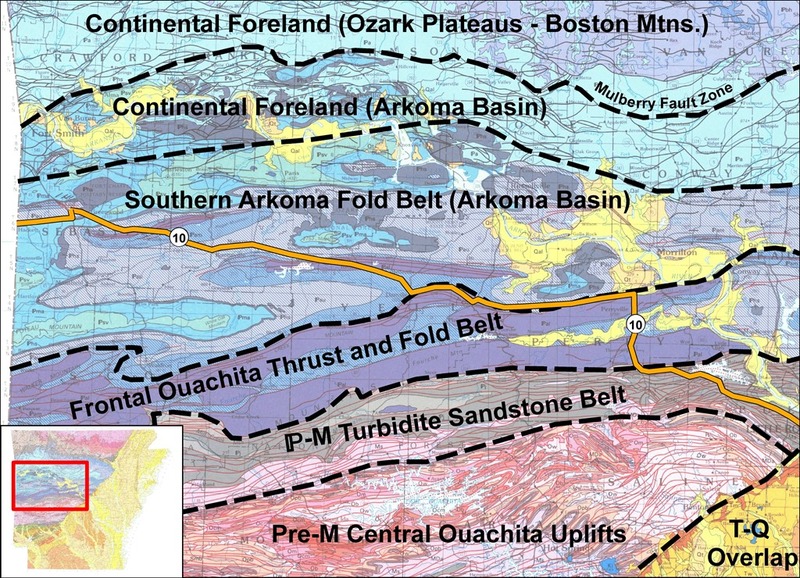 Appendices direct the traveler to several interesting side trips just off the main route and detail the characteristics of the gas and coal resources in the Arkoma Basin. This Geotour is written to be of interest to the general public, to students of geology, and to professional geologists who want to gain a more in-depth understanding of this beautiful and geologically complex region. So the next time you’re thinking of taking a scenic drive through the mountains of western Arkansas, consider traveling AR-10. And don’t forget to take along the Geologic Road Guide to make your drive more enjoyable and informative. This entry was posted in New Publications and tagged Arkansas, Arkansas State Highway 10, Arkoma Basin, Atoka Formation, Blue Mountain Lake Dam, Bonanza, Danville, fault, Fold, Geologic Road Guide, Geotour, Greenwood, Hackett, Hartshorne Sandstone, Havana, Jackfork Sandstone, Johns Valley Shale, Lake Maumelle, Little Rock, Magazine, McAlester Formation, Mount Magazine, Ola, Ouachita Mountains, Peripheral Foreland Basins, Perry, Perryville, Physiographic Provinces, Pinnacle Mountain State Park, Roadside Geology, Rose Creek Syncline, Savanna Formation, Stanley Shale, Waveland, Williams Junction on January 18, 2018 by argeology.